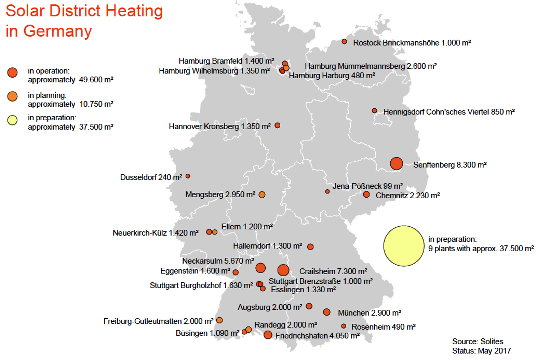 Interest in solar district heating is growing in Germany. A map by German research organisation Solites shows the systems currently in operation to be 23 totalling 49,600 m² of collector area (34.7 MWth). Last year saw the addition of four installations with a combined area of 12,921 m²; one of them was Germany’s first record-size solar district heating plant in 11 years, in Senftenberg. Solites has now developed a tool to calculate the yield of SDH plants. 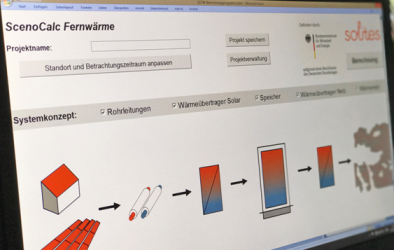 Called SCFW 2.0 (ScenoCalc Fernwärme 2.0), it is available as a free download at www.scfw.de and is hoped to increase transparency by improving the comparability of solar district heating plants and solutions. “To achieve broad acceptance, the tool is based on the international Solar Keymark standard and the widely used ScenoCalc tool for calculating annual solar collector output,” a Solites press release said in mid-July. ScenoCalc had previously been employed for estimating yield data on extended Solar Keymark certificates. The researchers from Solites have now expanded tool functions to include larger collector areas feeding into district heating networks. The developers of the tool emphasised that anyone intending to use SCFW 2.0 would need some knowledge about solar thermal. Users could input key system parameters and operation modes and have calculations carried out in seconds. SCFW 2.0 offered a first assessment of system performance, but did not replace professional design and sizing services. Input would not be checked for validity. Tool development was funded by Germany’s economy ministry. SCFW 2.0 is available in German only and there are no plans for an English-language version. The researchers, however, believe that the program can also be used for plants installed in other central European countries, because the user can add irradiation and whether data manually. The aim of Solites is to support sustainable growth in solar district heating in Germany. The map above shows 10,700 m² of district heating systems in the planning and another 37,500 m² in the preparation stage. Major drivers in Germany are solar-bioenergy villages, rural municipalities targeting a high share or even complete coverage of hot water and heating demand by renewable heat. Solites said that it intended to install a 3,000 m² collector field in the village of Mengsberg, with the contract having been signed in April. As part of the project, heating system supplier Viessmann would deliver a nine-kilometre-long turnkey district heating network to connect around 150 heat consumers. Another example that Solites listed in its July newsletter was the village of Randegg with a population of 1,000. Randegg’s heat demand has been met by a biomass boiler since 2009. It now plans to add a 2,000 m² collector field to it.